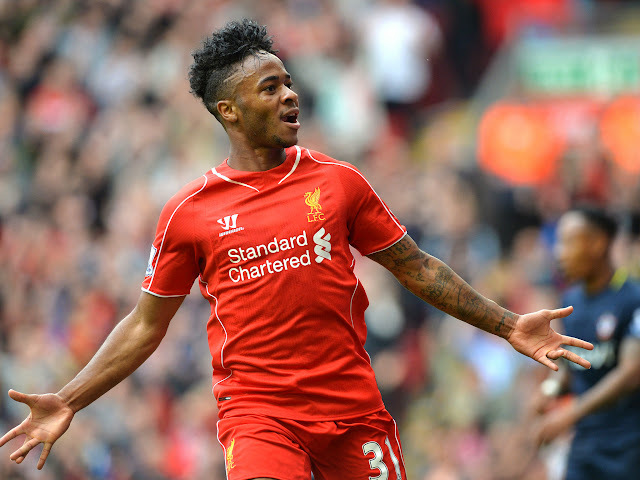 Sterling stole headlines with speculation of a move away from Anfield. Loyalty, nowadays means very little in Modern football. Something which is less preferred by superstars and instead, search for those extra pounds and loads of medals has much more significance. It has all been about Raheem Sterling for the past week or so regarding his contract issues at Liverpool Football Club. Rejecting a huge contract offer of £100,000 per week has made him one of the hottest prospects to look for, this summer, albeit he leaves. Liverpool signed him for around £600,000 from QPR in the summer of 2010 and now value the 20 year old at £50m after just 4 years of him being in their first squad. Where now, he has made a mark for himself and is one of the first names on the starting team sheets for Brendan Rodgers. Paying an ultimately low fee including clauses and add-ons, Liverpool have made a remarkable business from the 20 year old up till now. He has been something every big club looks for in their respective teams. But, who is being greedy here? The club, or the youngster who seemingly wants out for more medals and a big cheque after every week? Every player at some point of his career realises he needs to move on and try a big shot. Well, in Raheem's case, it looks like he got the feeling a bit too early. But, all these talks about Sterling betraying Liverpool is nonsense and paper talk. We all know about Carlton Cole's case at West Ham when Sam Allardyce blocked his move away to West Brom even when his contract ran out. Something unusual to see, nowadays. Since then, Cole's career went upside down and he has just played 123 minutes. So, it's all nonsense when someone says player power 'ruining' the game. Players at the top end earn a living and live a life which we all dream about. But the clubs still hold the aces. And even if you a superstar wanted by 'huge' clubs, they could still block your move. If Sterling leaves Melwood it will be Liverpool cashing in a lot, from the move. Also, QPR get a healthy sell on for this move. But the power, ultimately remains with the club because they can block a player moving in a way that would never be allowed in any other industry, field or walk of life. So, ultimately it can be seen that it will be Liverpool FC & Brendan Rodgers being the big winners in this Raheem Sterling contract saga. Liverpool and Brendan Rodgers will benefit from the saga surrounding Raheem Sterling.